I guess my wife and I are still pretty new to the whole Down Syndrome game(19 months) and even though we’ve settled in and look forward to our lives with Little Peanut we still wonder how people are going to react when we go to some place new like we did this past weekend. The anxiety of waiting for a reaction from people is certainly not at the top of the list when we go away, but it’s there and I wonder if that feeling is ever going to disappear. My nephew got married this weekend in Baltimore, MD which meant that family and friends from both sides were there to enjoy the festivities. For the most part people didn’t give us a second look, but on occasion there were those uncomfortable stares. I made eye contact and stared back at those who had decided to practice this rude behavior, but guarded my tongue, something I wouldn’t have done a year and a half ago. It’s getting easier to contain myself, but a part of me still wants to go nuclear on the “enemy”. I can’t be the only one that feels this way, I hope not. Like they say misery loves company. Families that have been touched by a child with special needs are always (I realize always is an absolute and there are those that may feel differently) talking about the glory’s and the beauty’s of their child and how wonderful life is. I certainly subscribe to that, but sometimes I feel as if I’m lying to myself. I love Amanda for who she is, with or without DS. She certainly has proved to be a pillar of love in our home and the very sight of her will put a smile on anyone that walks through our doors. We have noticed a big change with our other two children as well. Elle and James are both accepting of others without prejudice and a bit more patient with other children. James has a girl in his class with DS, the teacher told us that while the other kids in his class are less tolerant when it takes this girl a little longer to do something, James sits/stands by her until the activity is done. Because of this, the little girl has taken a liking to my son and both are good friends. I’m not quite sure if James knows that his classmate is special, we are just now talking with Elle, my oldest, about her baby sister’s special needs. I think it’s safe to assume that James realizes that something is a bit different, but he’s probably not certain of what it is, nor should it matter. Life is difficult, it isn’t always a bed of roses, we will likely have more bumps in the road than typical families, Amanda requires a lot more attention than our other two kids, there are things that my wife and I may not be able to do as we get into our golden years, however this is our life and we will know no other. At the same time, our over all outlook of life has changed for the best, the bumps in the road over time will become our norm, the extra time we spend with Amanda is incredibly wonderful, the interactions that all three of our children have together is breathtaking, and our golden years are to far away to even think about. We have accepted and embraced our destiny lovingly and enthusiastically. Its hard for a single guy like me to imagine the full emotions that come with having a child at all, so I can't say that I emphasize or understand what you are going through. However, I do respect both you and your wife. Stilling your tongue is the best way to handle things for sure ... no need to cause a ruckus, it would just scare your daughter, I think. I've always enjoyed reading your blog, you're an intelligent man, sir! I will say that after 17 years there are still occasions when I'm anxious about how Evan is perceived. I find myself more of an educator at this stage, and not so much a confronter. (Unless someone does something ridiculously rude. Then confront I will!) So I do tend to strike up conversations with total strangers. It definitely isn't the easiest life, but I am painfully aware that our circumstances could be a lot more difficult if Evan had been born with a more complex disease. Thank you for a wonderfully honest post, by the way. One of the things that I've found that seems to be implied in several of your blog postings about Amanda, is the idea that she will be living with you for the rest of your lives. Is that because she has a particluarly severe combination of difficulties, or is it that you haven't questioned the assumption? While, of course, if our daughter Meg needs us, we will always be there, our aim is for Meg to be as independent as possible, and that includes eventually having a separate place to live - either on her own, with a friend or friends, or in some kind of sheltered housing/support community. I have no doubt that when the day comes that Maggie and I are no longer around, her siblings will help look after Meg if necessary. But as far as is humanly possible, we will be trying to help Meg to live as independently as she possibly can, and I don't see this as unrealistic. I'd be really interested in your views on this Brian, and that of any other parents of children with DS or other special needs. Thank you for your kind words. Ah yes, the days of being single and holding on to your money. I agree that things could be worse. My wife and I do tend to start conversations with people when we are put in to a situation where it is appropriate. We educate as well, but I think we wait for the other person to start asking questions. I think that many sights regarding DS are full of fluff, that’s why I like to keep it real. No debate here. Amanda appears to be very healthy and doesn't have any severe medical condition, just the DS. We are certainly on the same page as you. We are going to encourage independence and raise her just like our other two. As she gets older and is at the age where she may want to move out and be on her own we will certainly support that decision and make every effort to make that happen At the same time we don’t want her to feel as if we are pushing her away. I think that one of the characteristics we like about DS is that it allows you to hold on to your baby just a bit longer. It’s hard to even predict what will be 18 years from now. Today people with DS are living healthier, longer lives than they did 20 years ago. We know a girl in our community with DS who will be graduating from high school this year. It’s quite cute, when ever we see her and strike up a conversation, the first words out of her mouth are “I’m graduating this year”. She is so excited about her accomplishments, and she should be. She has held down a job throughout her high school years; she is just an amazing person. These kind of stories are becoming more common now that society is becoming aware of how capable our special kids are. DS has come a long way baby. My thoughts are kind of cluttered today, so I'm not sure where I'm going with any of this or even if it makes any sense. Oh the stares, the stares!!! When friends are with me and experience THE STARE for the first time, they become so indignant it's almost funny. It's something you get used to, NEVER accept but come to realise it's part and parcel of being perceived as different. I deal with it in different ways, depends on my mood, on the circumstances etc. Quite often I find the "starer" is somebody who knows someone with DS and we strike up a conversation (I try not to be the starer when I see a child/person with DS and I don't have Sarah with me to explain my interest, rather I usually initiate conversation). Usually if it's a child who is staring I will smile and say "hi, this is Sarah, what's your name?" and the child will either smile back and shake hands with Sarah or look away in embarrassment at being caught. If I am not feeling sociable I will sometimes just stare back. The funniest incident was last year when Sarah and I were waiting at the lights to cross the road. On the other side of the road was a woman with 5 children - all staring at Sarah. As we passed in the middle of the road, Sarah looked at them and said "What you lookin at?" and made a rude gesture - it was comical, the stares turned into open-mouthed stares and all I could do was laugh! I normally don't condone rudeness in my children but just this once I let it pass - c'mon the girl just did what I would LOVE to do at times! As to the future, well I can empathise. Sarah is 13 so we are closer to it than you are and while I do envisage Sarah leading an independent a life as possible and hopefully not at home with her Dad and I, I also accept that Sarah is going to need us more than the boys will and will probably not lead a fully independent life and yes it is a worry. Also the worry of "what about when we are gone". While I hope her two brothers will look out for her I certainly don't expect them to take on responsibility for her. Reminds me of a very poignant moment when Sarah was maybe 4 or 5, so Simon her older brother was 7 or 8 (3.5 years between them) - I was getting Sarah ready for bed, brushing her hair and Simon said "when Sarah goes up and has her own house, who is going to brush her hair for her?" - that got to me so much at the time. Well thankfully Sarah can now brush her hair herself so I don't have that particular worry!!! K have probably gone on way too long so will sign off. One day at a time. That's how we look at it. We don't look to far into the future. We don't really know how things will be 20 or 2 years down the road, but we will handle whatever presents itself when it does. We just don't worry about it. Jackie is a wonderful little girl who just so happens to be differently abled. Now, do we struggle in certain areas? Sure we do. Like right now we are still struggling with potty training, she has lots of accidents. We do the best we can at the time and move on. Our children with DS will have their struggles in life, but so do our other children. They are just different struggles...but struggles all the same. I know where you are coming from. It's easy to worry, but we have made a decision that we just won't do it. It will be hard at times, but be strong (which I know you already are). From what I've read here I think you're doing a wonderful job with Amanda. She has a loving family and that will get her through everything life has to throw at her. She's a lucky little girl. As for the staring, we don't really notice that. Everyone we meet are wonderful and don't make a big deal of it. Jackie may live independantly one day, maybe not. If she just continues to live with us her entire life that's no big deal. That's way down the road. You and your wife seem like caring and wonderful people and your daughter will do just fine. 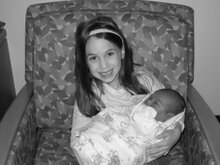 When Elainah was born, I was completely consumed by the potential reactions of others. Initially, we just didn’t go much of anywhere and when we did, I carefully surveyed the scene for onlookers. I cannot tell you when this feeling changed-but I know now that it is a rather rare occasion when I am concerned about what someone else thinks about being exposed to my child. My Elainah’s only requirement for extra attention and care are her health problems, not her DS. She is completely mobile and I really do not notice any change in parenting of her versus any previous child. I suppose that knowing children and their family elements are different, it is completely feasible that the effect of a special needs child on one family can vary from that of another. I guess that while it may seem unrealistic or naïve to believe that life with my daughter who has DS will be no different than life if she did not have DS, but this is the vision my family holds for her and so far it has worked for us so far. As her needs change, if they do, our household will adjust to meet them. I know that all individuals have a range of levels in functioning, and we have been fortunate that at this point, outside of speech, Elainah is on target for most everything. 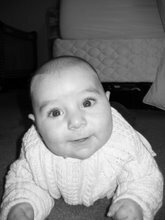 She began crawling at eight months, she climbed stairs at ten, and walked fully unsupported at just fourteen months. She is very independent and she is now trying to mimic many actions that go on in our home such as getting dressed or cleaning around the house. Reality is-there will be delays and that her IQ will likely not be that of a rocket scientist, but I can’t allow myself to focus on what isn’t when there is so much time to focus on what is. 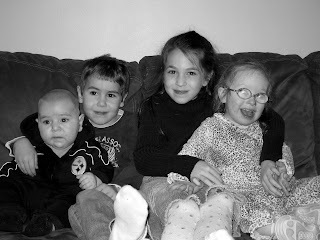 I have five children in my home, each as individual as the next, they have five different personalities and dispositions. They all play a different role in our house. My children have been affected by Elainah has DS but in a rather different way. This could be because all but one are much older than yours. My children all go out of their way to communicate with students at their schools that have DS. I suppose that they wouldn’t do this as much if their sibling didn’t have DS, and they have had friends that think it is really strange for them to sit on the bus or at lunch with them. I guess my children are just more compassionate now about a condition they are familiar with first hand. I know that there are always going to be some issues whether educational, medical, cultural, or otherwise that our family will undergo as related to having a DS child. But for me it just isn’t a question that she is a part of our family because she was intended to be. In closing, I feel it is rather unfortunate that the medical world still perceives the diagnosis of DS as rather a burden that should be avoided at all costs. The reality is that she has an extra chromosome on her 21st pair and this is the only genetic difference from someone who has DS and someone that doesn’t. I know there are other factors that come along with this, but it is not the end of the world to have a child with DS and I cannot imagine life without Elainah. I apologize for my long comment-as it seems to be a bit of a letter at this point. Opps! So sorry for the few typos I caught after I posted. I am usually a bit more careful about this. What an amazing blog. I am a teacher who specialises in working with Down Syndrome and Autistic children. I will definately pass on your blog address for parents who need reassurance that they are not alone. I hear what you’re saying. We certainly do try and take things one day at a time. There are days where I have a relapse for no apparent reason. Thank you for your kind words and understanding. Thank you for joining my blog. Elainah is such a beautiful child. You are definitely correct, raising Amanda is really no different than raising our other two children with the exception of the therapists. I suppose that I don’t really care about what strangers think of Amanda because they don’t know her, but it’s sometimes a reminder to me that as she gets older there will be people (kids mostly) that will tease her; I’m just speculating here, and its my duty to protect her. Don’t worry about the typos or the length of your posts here. I am the king of typos. Thanks. You certainly have a noble and respected job. Please feel free to pass on my site to others . Hi, thankyou for such an honest post. I love your blog. Hope you don't mind but I've recommended it on a discussion board (http://www.nads.org/cgi-bin/ultimatebb.cgi?ubb=get_topic&f=3&t=007129#000012). Thanks for visiting my blog. Please feel free to recommend my site to anyone (almost anyone). Come visit again. What a great post. 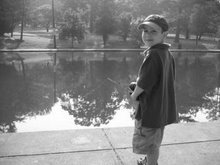 I have had similiar situations like the one I wrote about the day we had out outing at the zoo. The looks are there and our mood does effect our reaction. I usually try to start a conversation with people when I see them looking. In regards to Kim's part of this I think the world is open to all kinds of independent possibilities in the future. It's a future I am very excited about. I am currently in the process of completing a "new parent handbook" for those folks with a recent Ds Dx. Would it be possible to include this blog in our book? I'm flattered. A handbook for parents who have kids with DS is certainly a good idea. If you feel that my blog is worthy of entry into your book, please feel free. Let me know the name of the book when it is finished and where I can get a copy. Stop by my blog anytime. We have been incredibly fortunately. Although it's obvious that Ellie has Down syndrome, we haven't had to deal with a lot of rude stares thusfar. More often, we get the opposite reaction (people gushing over our beautiful little girl). I'm enjoying your blog. I apologize for taking so long to respond to you email (from July!) and come by to visit. I hope you don't mind that I've added you to my blogroll - it's very nice to have another dad (other than my husband) in their with all the mamas. I'm Sonja and Jessie's mom. Sonja is my typical 15 yr old who is into all things teenager like. 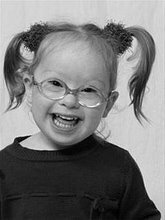 Then we have Jessie, our 6 year old who was born with Down syndrome. I can relate to the uncertainty when taking Jessie to new places-heck I even still worry when we take her to the same old places.I have had to learn not to be too protective-but I certainly understand the feeling.